A bit outside the scope of this blog (maybe), but just too cool to overlook. Augmented reality in chemistry education. This is a guest post from Samantha Morra of EdTechTeacher.org, an advertiser on FreeTech4Teachers.com. Augmented Reality (AR) blurs the line between the physical and digital world. Using cues or triggers, apps and websites can “augment” the physical experience with digital content such as audio, video and simulations. There are many benefits to using AR in education such as giving students opportunities to interact with items in ways that spark inquiry, experimentation, and creativity. There are a quite a few apps and sites working on AR and its application in education. Elements4D, an AR app from Daqri, allows students explore chemical elements in a fun way while learning about real-life chemistry. To get started, download Elements4D and print the cubes. As every year this month we had the yearly Mexican Reunion on Theoretical Physical Chemistry organized by prominent researchers in the field, such as Dr. Emilio Orgaz (UNAM), Dr. Alberto Vela (CINVESTAV) and many other. Over 150 different works were presented during this edition which took place in Juriquilla, Querétaro at one of the many campuses of the National Autonomous University of Mexico scattered all around the country. Below you can see some pictures from the talks and the first poster session. Mechanistic proposal by Frontana-Uribe et al. The energy profile, in which all transition states were calculated with the QST3 method, is presented below, calculated at various levels of theory. 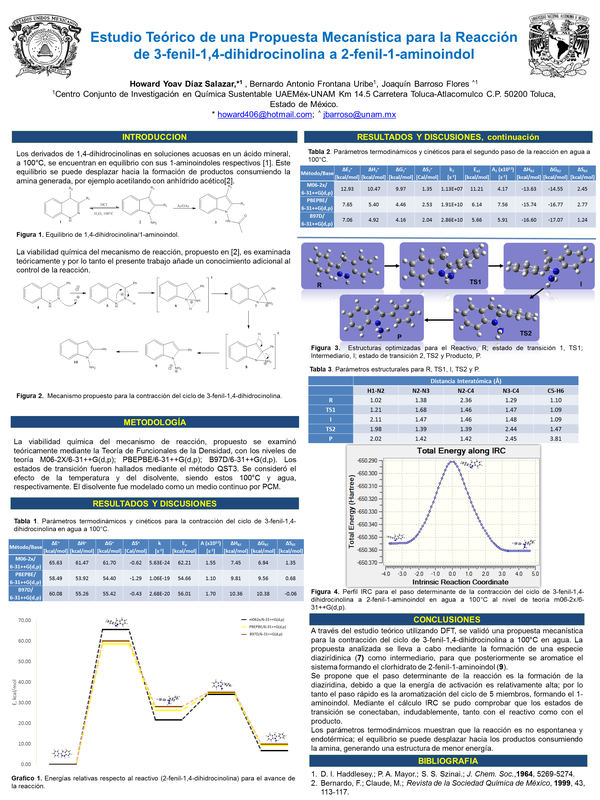 Also, the Internal Reaction Coordinate (IRC) connecting both states was calculated and is shown further below in the full poster. From this results we believe that a new mechanistic proposal is needed since the energy barrier for the first step is quite high (~60 kcal/mol) and hence a bit unlikely to occur through that transition state. Nevertheless this is a first approach to elucidating a mechanism and the more knowledge about it the higher the control will be on this chemical transformation. A full version of the poster is shown below for your convenience (Spanish). See you all at the next RMFQT in Morelia 2014! 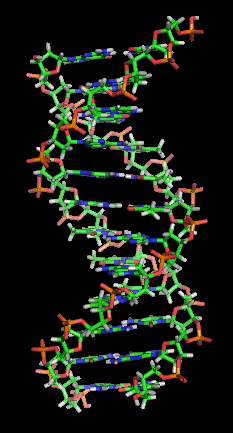 #RealTimeChem – Happy birthday DNA! What a happy coincidence -if indeed it was- that #RealTimeChem week happened to coincide with the sixtieth anniversary of the three seminal papers published in Nature on this day back in 1953, one of which was co-authored by J. Watson and F. Crick; of course I mean the publication for the first time of the structure of deoxyribose nucleic acid, or DNA, as we now call it. Nature’s podcast released two episodes (called ‘pastcast’) to celebrate DNA’s structure’s birthday, one of them is an interview with Dr. Raymond Gosling who in 1953 worked under Dr. Rosalind Franklin at King’s College London in diffractometry of biological molecules. If you haven’t listened to them you can get them here at nature.com/nature/podcasts. Of course, the history around the discovery of DNA’s structure is not without controversy and it has been long argued that the work of Franklin and Gossling didn’t get all deserved credit from Watson and Crick. 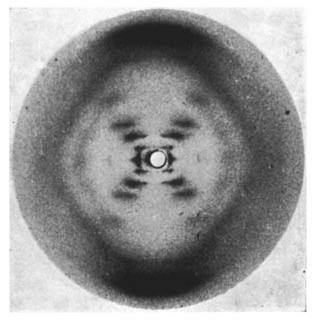 In their paper W&C acknowledge the contribution of the general nature of DNA from the unpublished results by Franklin’s laboratory but that is as far as they went, they didn’t even mention photo 51 which Crick saw at Wilkins laboratory, who in turn got it from Gossling at Franklin’s suggestion. 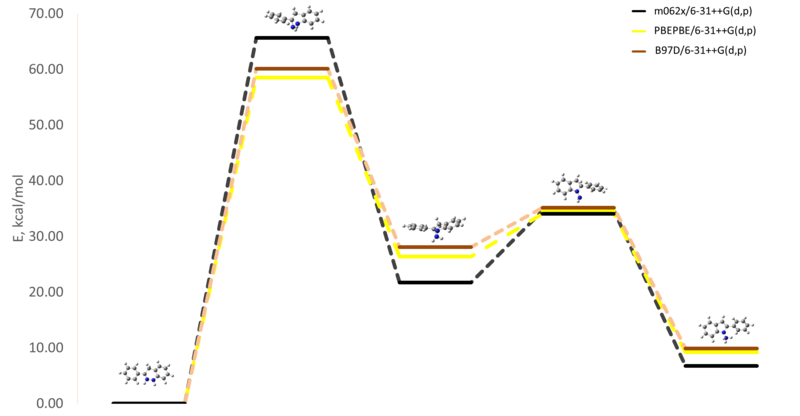 Still, no one can deny that the helical structure with which we are now familiar is their work, and more importantly the discovery of the specific pairing, which according to Gossling was a stroke of genious that probably couldn’t have happened in his own group, but without Franklin’s diffraction and Gossling’s crystallization there was little they could do. Details about the process used to crystallize DNA can be heard in the aforementioned podcast, along with an inspiring tale of hard work by Dr. Gossling. Go now and listen to it, its truly inspiring. Above, the iconic Photo 51 taken by Franklin and Gossling (have you ever noticed how most scientists refer to Franklin just as Rosalind but no one refers to Watson as James? Gender bias has a role in this tale too) To a trained crystallographer, the helical symmetry is evident from the diffraction pattern but going from Photo 51 to the representation below was the subject of hard work too. There are million of pages written during the last 60 years about DNA’s structure and its role in the chemistry of life; the nature of the pairing and the selectivity of base pairs through hydrogen bond interactions, an interaction found ubiquitously in nature; water itself is a liquid due to the intermolecular hydrogen-bonds, which reminds us about the delicate balance of forces in biochemistry making life a delicate matter. But I digress. Millions of pages have been written and I’m no position of adding a meaningful sentence to them; however, it is a fascinating tale that has shaped the course of mankind, just think of the Human Genome Project and all the possibilities both positive and negative! 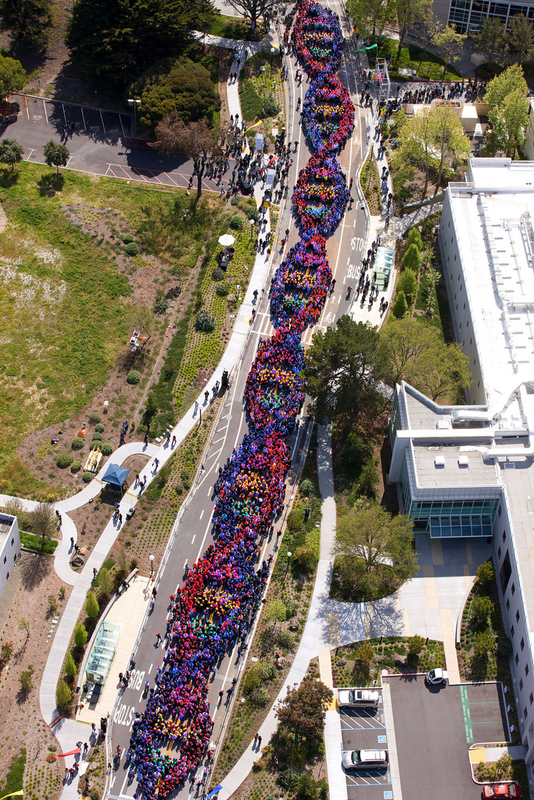 DNA and its discovery tale will continue to amaze us and inspire us, just like in 2011 it inspired the Genetech company to set a Guiness World Record with the largest human DNA helix. 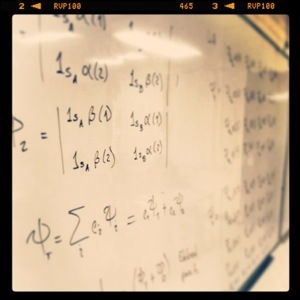 Welcome of the third installment of #RealTimeChem, the diary. As I did yesterday and the day before, I will summarize my day in chemistry throughout the Tweets sent over this event. But in the middle of the day there was a conference at Instituto de Química, in Mexico City, that I wanted to listen to. Dr. Marcos Hernández is a good colleague of mine who deals with asymmetric organocatalysis. I like his work a lot and I hold him in high esteem so I asked for a video transmission of his talk to be sent over to CCIQS at Toluca. In the following two Twits you can get a glimpse of our video conferencing facilities. Today I took some time to have a few interactions with other participants of #RealTimeChem and got to follow very interesting people. Definitely, after this week I will become a more active Twitter user (ouch!). 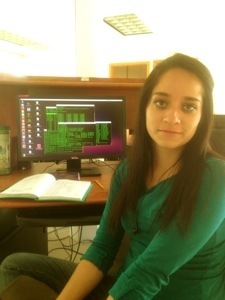 But the research must go on, and today Maru started working on rendering the electrostatic potential surfaces for a rather large set of calix- and thiacalix[n]arenes for our line of research on molecular recognition agents. This is pretty much it for today; I’m very tired and I still need to work in other things so I’m off for now but stay tuned for more tomorrow when this blog will celebrate the 60th anniversary of the publication of DNA’s structure in Nature.